From dentists to healthcare specialists to the oil and gas industry, x-rays are used across the country for research and life saving purposes. With productivity down in a large number of these industries, we’re going to present one way it can be improved without compromising in other areas. X-ray scanning is the process of digitising x-rays using state of the art scanners which will capture a digital image and convert it to PDF, TIFF, Jpeg etc. The digital image can then be fully indexed to ensure the file can be found through a simple text search of patient name, date of birth, date of x-ray or any other relevant field. These digitised x-rays can then be stored in an electronic filing system which is where the efficiency boost comes. How Does It Speed Up Productivity? 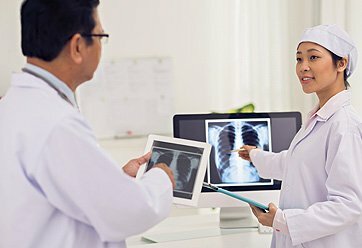 Storing x-rays digitally will make them easily retrievable, through quick searches of relevant data, and will also mean they can be sent to the relevant people quickly and easily without the hassle of manually sending the x-ray. This quick retrieval and sharing can have positive effects on all kinds of businesses that deal with x-rays on a regular basis such as the dental health sector and the oil industry but in particular, this digitisation will benefit the NHS and healthcare sector. Back in 2013, health secretary Jeremy Hunt challenged the NHS to go paperless in order to save funds and improve efficiency. With 900 more patients admitted to hospital everyday rising the total to a staggering 42,400 people, the NHS need all the help they can get to speed up patient waiting times. 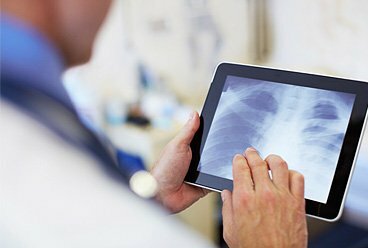 We have mentioned in the past about the benefits of medical record scanning but x-ray scanning can also be added to the digital family and relieve some of that increasing pressure on our healthcare service. Office and hospital space can be freed up without the need to waste valuable space by storing hard copy x-rays. X-rays can reach specialists who may be off-site to aid quicker diagnoses. Morale will be boosted when doctors and nurses can do their jobs more efficiently and the public can see improvements being made. Pearl Scan can digitise small to large amounts of x-rays and convert them to a range of formats including PDF, TIFF, Jpeg, Bitmap and DICOM. Our service has been audited and approved by many NHS, local authorities and private blue chip companies for security and quality certificates and our scanning projects are completed under strict supervision. We can also handle the entire process from collection and scanning to delivery of digital x-rays, fully indexed, in your preferred format. Our website has more information about x-ray scanning but if there’s anything else you would like to know, give us a call. You can also receive a free, no obligation quote for your scanning project by following the relevant links below.